I have been wanting to share these eos with you for a while but you know, I have way to many awesome things to post about all the time and my kids keep me busy so I never have enough time to post. 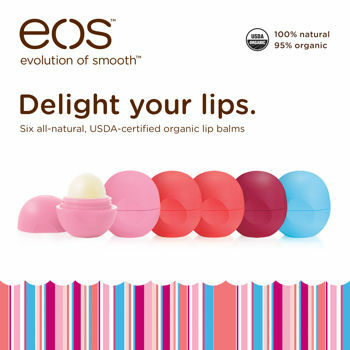 But Costco.com is running a great deal on eos with a coupon right now and free shipping so I had to hurry and post about this little gem so you could get some and stuff them in your stockings for all your lip balm, chap stick loving kiddos. This stuff is 100% natural and 95% organic, so when your toddler eats this they will LIVE, yahoo! My toddler has gotten his little hands on too many of these already and eaten, yes you heard right, eaten the whole thing. That’s what kids do right, eat lip balm. So now you mama’s don’t have to worry you can buy your kiddos eos and if they get eaten, no big thing. Last year my girls started asking for these eos so I had to check them out for myself and when I did I was pretty impressed so I got my girls a few last Christmas and now they are in the history books, my girls love them, my toddlers love them, and I love them so they are a winner at this house. Here’s the link on Costco.com for this set, it’s for 6 lip balms, this is a great deal considering at say Target they are around $3 each. I also found THIS other set on the Costco website which is 3 eos lip balms and 3 eos lotions, we’ve used the lotion before too and love it as well. It’s perfect to slip into your purse or a back pack to help keep those dry hands moist and fresh. The hand lotion is only 97% natural so I don’t know if it’s safe if it gets eaten you’ll have to check that out. Happy eos to you this holiday season, I hope you love em like we do. ooh…great deal! Thanks for letting us know! !